“Greedy Burger” So big, no room for the sides!!! Try sinking your teeth into this 3 meat 3 pound burger with double cheese, 5 slices of extra crispy bacon, lettuce, pickles, tomatoes and grilled onions, wrapped in a cheese bread loaf. This 3 of a kind always beats the house. 1 Deep dish 8” frozen pie crust, 6 apples, 1 stick of butter (Salted or unsalted), 2 tsp flour or cornstarch, 1/2 cup sugar, 1 tsp vanilla extract, 1 tsp almond extract, 1 tsp rum extract, pecans or almonds. Preheat oven to 350 degrees. Peel, core and cut apples into slices. Melt butter in bowl and whisk in vanilla, almond and rum extract. Whisk in flour or cornstarch. Add apples slices and turn in mixture until fully coated. Pour evenly half the apples into pie crust and sprinkle 1/4 cup sugar over apples. Add the other half of apple mixture and sprinkle 1/4 cup sugar over apples. Bake in oven for 25 minutes. 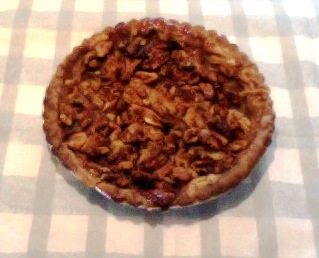 Fully cover the top with pecans or walnuts. Finish baking for 20 minutes. Cool at room temperature for 20 minutes and refrigerate for 4 hours before serving. serve plain or with your favorite ice cream and cool whip. Please “Like” our Cameron Enterprise Of Kankakee, IL Facebook page. 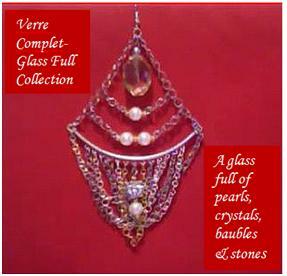 Verre Complet – Glass Full Collection featuring Dangle Earrings. 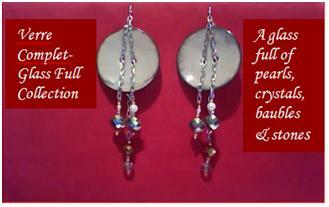 Verre Complet – Glass Full Collection featuring eclectic button earrings. If you think these earrings are cool and different, please like our Cameron Enterprise Facebook page. Trying something new and different! Verre Complet – Glass Full Collection featuring eclectic button earrings.